Pick yourself up a copy. If you can’t find it at your local book store, get it here! This is the story of two architects, tested on the sooty, soiled grounds of late-19th Century Chicago: Daniel Burnham, an architect of buildings in the age of steel and the director of works of the great World’s Columbian Exposition of 1893; and H.H. Holmes, an architect of manipulation, murder, and the macabre who killed dozens of people while staying hidden from the police, just blocks away from the fair’s entrances–both were equally ambitious and worked incessantly toward their respective goals. 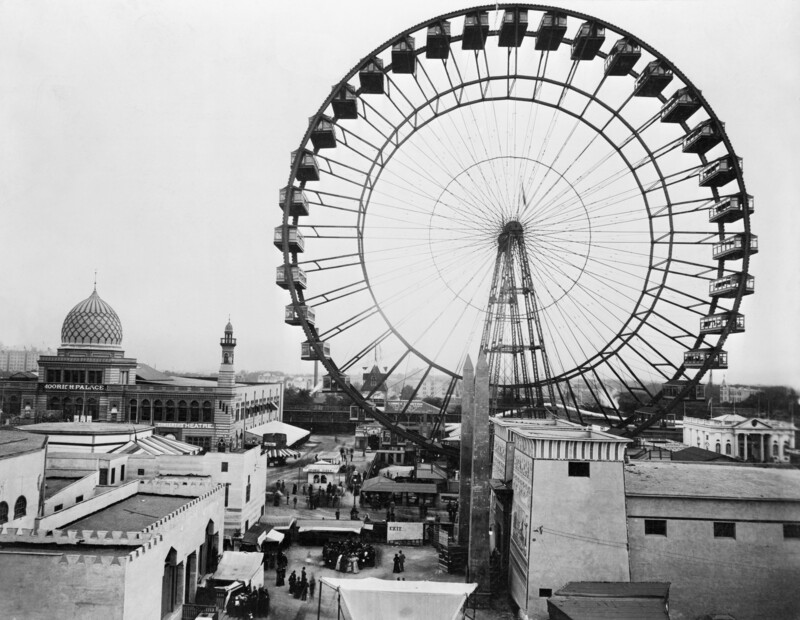 At the World’s Fair, they represented the city’s two faces: the White City and the hell hole, the symbol of hope and the harbinger of horror. The beginning of the book may seem a bit disjointed–jumping from Burnham’s story line to Holmes’s and some seemingly disconnected players–but this simply adds to the fascinating coincidences that summed up to those fateful months in 1893. Larson manages to make me feel that fascination, that awe, Chicagoans must have felt during this time. Out of all the events, in all the cities, in all the world, Holmes has to walk into this one and use it as his murdering grounds. The Chicago of the late 19th Century was the breeding ground of innovation. 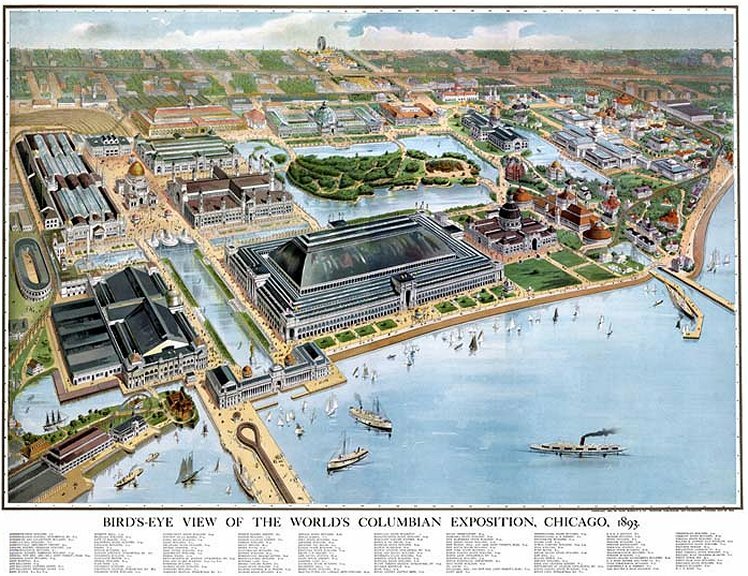 Specifically, the World’s Columbian Exposition was the setting for numerous debuts of human ingenuity: Ferris Wheels, spray paint, Pabst Blue Ribbon, Shredded Wheat, and the Dewey Decimal System, to name a few. But first, Burnham and his team of planners and builders had to overcome waves of harrowing obstacles. Everything from rainstorms to unexpected, tragic deaths to funding trouble came close to keeping Chicago’s World’s Fair from being built. After it was built, everything from fires and economic collapse and skepticism came close to keeping the fair from succeeding. The evidence of Larson’s loving research is astounding. The detail he uses in building the reader’s image of the fair is what makes TDitWC worth your while. 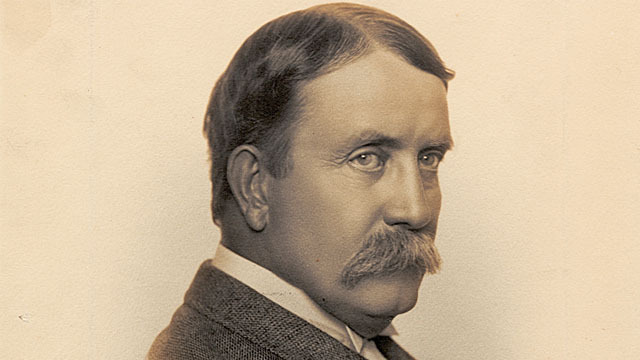 The man himself: Daniel Burnham, Director of Works and creator of the impossible. He had his flaws, too, but we don’t need to bother with them too much. Of course, if you’re a crime fiend like me, it may be the details of Holmes’s blooming psychopathy that makes you fall in love with this book. H.H. 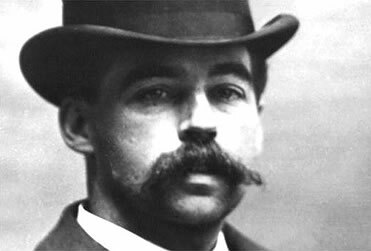 Holmes, born as Herman Webster Mudgett, comes to Chicago already an accomplished swindler. In this new city, growing like a weed, Holmes finds room to stretch his wings. Holmes conned his way into accruing wealth and eventually building a three-story monstrosity that many called “the castle.” This gloomy building with haphazard hallways, windowless rooms, and hidden air ducts became the center of Holmes’s web of deceit. He began extending his feelers, laying his traps–his quest to conquer human lives–just as Burnham begins his to conquer the hearts of Americans with the nascent Columbian Fair. It’s strange to see the parallels. Both men want to gain utter control over their prey. They want to enrapture people, gain power over them, control their hopes and quell their doubts. Burnham wants to accomplish this through the artistry of architecture, throwing millions into reverie at what humankind can accomplish in an impossibly short amount of time. Holmes wants to seduce people with his charm and control their lives, and eventually control their deaths. The man himself: H.H. Holmes. To look at him, you wouldn’t suspect him, but that was the point. Holmes finds his perfect setting in seedy Chicago. Larson quotes a madam of the time as saying, “I think Rome at its worst had nothing on Chicago during those lurid days,” and if anyone knows the real meaning of lurid, it would be a woman of the industry. In this younger, nastier Rome, Holmes drew in dozens of women into his confidences (and sometimes into his bed) only to catch him in his web. He luxuriated in his victims’ utter trust and then utter panic at the moment they realized their doom. All this in stark contrast to the game-changing, awe-inspiring fair just a couple of hundred yards away. 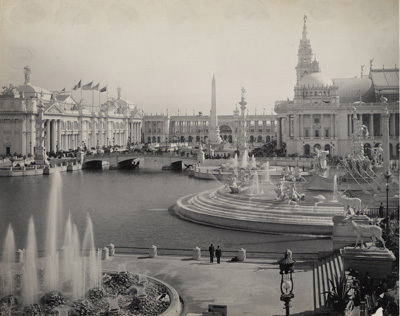 The Fair was more than a spectacle of industry or even the spawning ground for innovation, but it truly was a magical land–despite the grime of millions (pre-filtered water! pre-modern hygienic practices!). The White City was a place where people of all classes and ilk could mingle, where the world leaders could stand in awe at the same sights with the poorest of the poor. Holmes himself attended multiple times, bringing some of his victims, and it’s possible he may have run into any number of the era’s sainted inventors, like Nikola Tesla or Thomas Edison or maybe Daniel Burnham himself. I wouldn’t want to give spoilers, but some of the miraculous byproducts of the World’s Fair brought me to tears, and Larson’s incredible juxtaposition of Holmes’s darkness with the Fair’s efforts toward hope and the future just emphasizes where humanity’s true beauty shines through. This isn’t to say Larson is some kind of Humanist or throws an unfair, positive spin on this epic tale, and there were countless negative repercussions of something so grandiose. 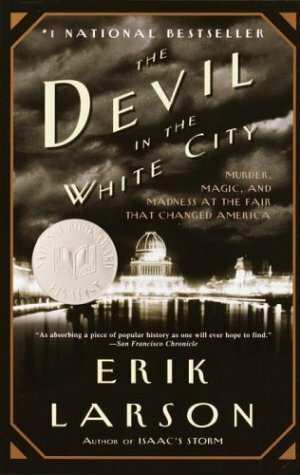 I know only that I didn’t come away from this reading experience feeling bogged by the fear of serial killers or disgust at heartless capitalism; I have come away satiated, more knowledgeable, and thrilled at reading more Chicago history. Then I was like, “Oh, I want to see it, too!” And then I was like, “Aw, they burned it to the ground.” Goodbye, ethereal beauty. But thank goodness for photography and Erik Larson!